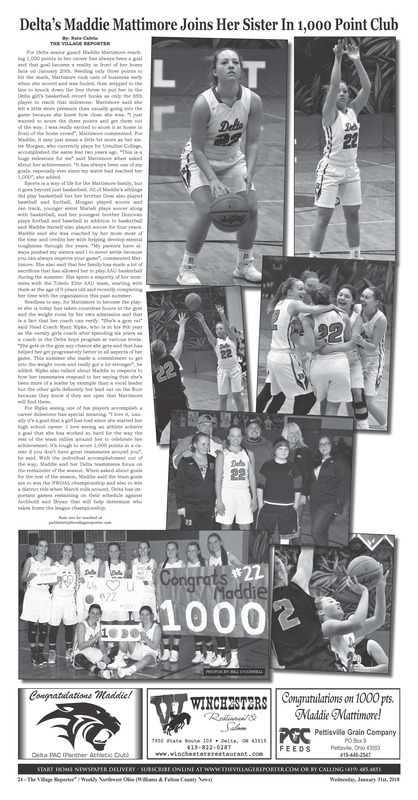 Abby Freeman added to her name to the list of Delta Lady Panthers to reach 1,000 points in a career on Saturday, January 12thin the Lady Panthers non-league game at Stryker. Freeman, who needed just four points to hit the plateau after a 34-point performance the night before, knocked done two triples in the first quarter to put her over the top. Freeman said she knew before the season that reaching this milestone was a possibility. “It’s added a little pressure, but I knew I just had to continue playing my game and not let it be a distraction to me or my team. I am thankful that I got the chance to reach this milestone and reach it with great teammates, coaches, and community support”, said the senior who will continue her playing career at Cedarville University, which is located just outside of Dayton, next season while majoring in nursing. Freeman is the fourth Lady Panther in the last five graduating classes to hit 1,000 points joining Kathleen Przeslawski (2011), Brigan Wymer (2015), Morgan Mattimore (2016), and Maddie Mattimore (2018) in reaching the mark. In total, Delta has had five girls reach 1,000 points with Kim Bushman accomplishing the feat back in 1981. 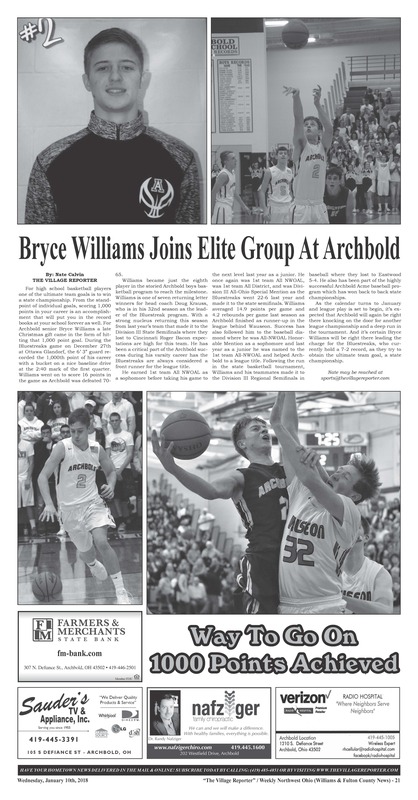 The last four players to hit 1,000 points have been under the direction of Head Coach Ryan Ripke and being able to be a part of their success is something Ripke knows makes him very fortunate. “For me as a coach, it means that I have a lot of girls who have invested and continue to invest a lot of time into becoming the best basketball players they can be and most of them don’t get to 1,000 career points. I love seeing them achieve goals they have set and I love to see the excitement of their teammates. It really is a team accomplishment because you need good teammates to be able to achieve this. The fact that we’ve had multiple girls hit 1,000 points means that at some point they have had to wait their turn to be the main scorer. Because of their patience and wanting to win, we have not had a lot of girls competing for shots and that speaks to the character of these girls”, explained Ripke. Abby has been a varsity member since her freshman year when she averaged 5.4 ppg and shot 32% from behind the three-point line. Her success continued into her sophomore year when she was named 2ndTeam NWOAL and 2ndTeam District and her junior year performance led to her being named 1stTeam NWOAL, 1stTeam District 7, and AP 3rdTeam All-District. So far this season, she’s averaging 16.4 ppg and 4.2 rpg and has helped Delta to a 13-1 record and a top ten ranking in the Division III AP poll. Her improvement on the court has been a result of countless hours in the gym but it’s her improvement in being a leader that stands out to her coach. “I think the biggest thing I’ve seen improve is her confidence in her role as a leader on this team. She has always been a leader by example but the past couple years, she has really grown into a vocal leader both on and off the court”. Abby points to the support of her family as being a key to her success. “My family has been so supportive of everything I do. I do not think my parents have ever missed any of my games in middle school or high school, which is amazing. They each drove me to basketball tournaments in the summer and have sacrificed so much time for me. My dad is always willing to go up to the gym and rebound for me. My family’s support means everything to me, and they have impacted my basketball career in so many ways”, she stated. The success on the basketball court has carried over to the classroom for Freeman where she currently holds a 4.0 GPA and is number one in her class. “Everything I said about her as a basketball player, I can say about her as a student”, added Ripke. “She works extremely hard and very self-motivated. She has high goals for herself and she is very focused in achieving her goals. She takes pride in everything she does”. When asked how she balances the two, Abby said it has been something she’s always had to do. “It is just something I have always done because I have always played sports. I try to prioritize and manage my time wisely because I am always so busy with school and athletics”. Freeman is also a Student Council member and involved in Spanish Club, SADD, FCA, True North Church Youth Group, and was a 3-year member of the volleyball team. 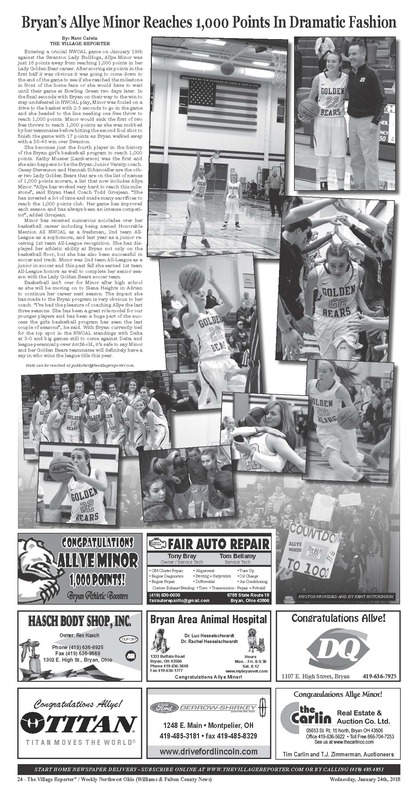 Abby has lofty goals for herself and her teammates for the remainder of the 2018-2019 season which include winning the NWOAL title and trying the win the school’s first district championship. Wauseon wrestlers win STATE TITLE! Spiess only second wrestler to win three state titles in NWOAL history. Read Kearney's story by following this link.